I’ve come across a pair of definitions for lightening (n.) which, while not antonymous (or antagonymous) nonetheless represent a kind of polarity. And not any old polarity–the polarity, probably. [The British & World version is identical but for the substitution of ‘womb’ for ‘uterus’–I had not realized this was a AmE-BrE distinction]. This is the only definition under this lemma in Oxford Dictionaries Online, which is a bit odd, as the Oxford English Dictionary has two separate lightening lemmas (one for each sense of light, i.e. the opposite of dark and the opposite of heavy)–and each lemma has two definitions. that exhilaration or revival of the spirits which is supposed to occur in some instances just before death. 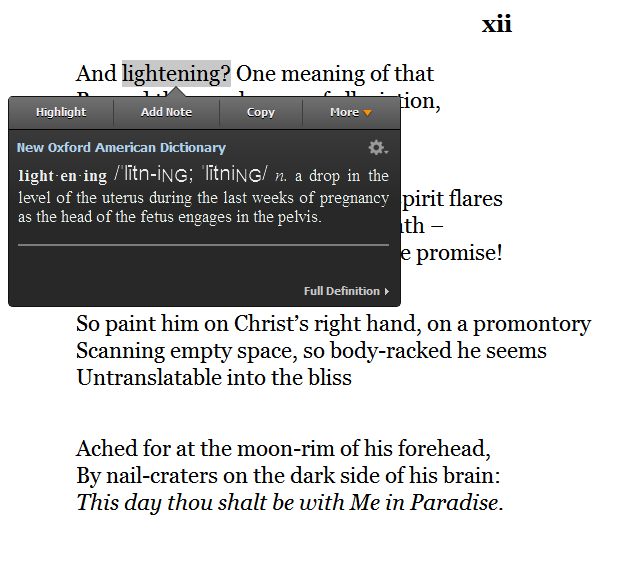 There are other contexts where the light/dark and light/heavy converge (a light mood is one – is that bright, or free of the weight of one’s troubles), but this one is rather extraordinary: lightening as a precursor to birth and to death; an unburdening to begin life and an undarkening to end it. Yet to get around to this way of seeing it one has to cobble together definitions from multiple dictionaries, each with its own way of treating lemmas, phrases, etc.. Merriam Webster, for example, would be no help at all, as it does not split the lemmas, giving lightening only as a form of lighten, v., which entry lumps in both the un-dark and un-heavy senses together.